Roof Care Tips for the Winter. Above All Construction has been helping customers make their homes more beautiful and more secure for years, and we are always ready to share tips with Kansas City and Leawood homeowners who want to avoid damages and keep their roofs in good shape all winter long. Not only will these tips help homeowners maintain their roof’s integrity, but they can also save a lot of money in the long run in repairs and premature roof replacement. You, too, can follow the Above All Construction winter roof care tips in order to protect your Prairie Village or Overland Park roof for years to come. Here are a few of the things we tell our customers to help them maintain their homes’ roofs. Remove debris before it snows. Lenexa and Shawnee residents, as well as those all over the Kansas City area, should pay attention to the forecast! Removing leaves, small branches and twigs before snow hits your roof can help keep gutters clear and promote run-off. 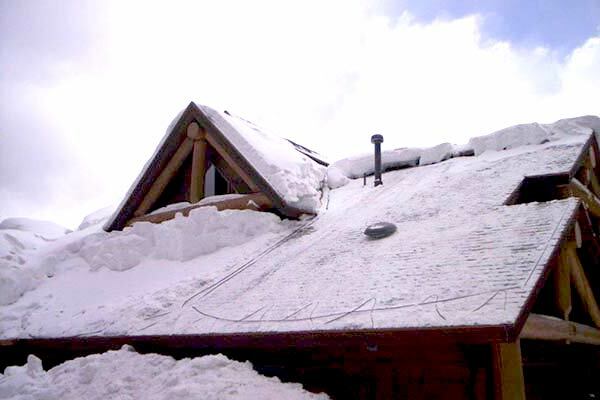 Debris on your roof will hold even more snow in place and add even more weight, as well as the potential for ice dams. Call a pro to prune trees back. In many instances, limbs that hang over a roof can be a bigger culprit than the weather itself. Calling a professional tree trimmer or handyman to remove dangerous limbs can ward off many weather-related problems for Olathe or Merriam residents before they happen. These trees can get extremely heavy with the weight of ice and snow, which, as you can imagine, makes them even more dangerous if they weaken and fall. Clear snow off your roof. A standard guideline is to clear the roof of snow for every 6” of snow that falls, whether this occurs within several hours or several days. This helps prevent ice dams and keeps extra weight off your roof from day to day, eliminating unnecessary risks and expensive roof damages. Snow that sits on your roof for days on end can get impacted and is much more likely to refreeze into solid ice. If you have buildup in your gutters and downspouts, there is no way run-off can be removed from your roof. Year-round gutter cleaning is something we highly recommend. If you can’t do the job yourself, there are many services available in the Kansas City area for residents and business owners alike. Keeping gutters clean is especially important during the winter, when there is, on average, more precipitation affecting your roof. In short, you want to be proactive every chance you get in order to keep your roof in good condition all winter long. Above All Construction is well versed in all manner of home care including roof and gutters. These things are your home’s first line of defense in the coldest months, and with our help, your home can maintain its insulated, toasty interior all winter long.